Sarah Kanes script ”Renset” seems to be grotesque violence and tragic on the outside. The characters gets exposed to extreme deprivation in an apatic and indifferent world. Of all the plays written by Kane she considered “Renset” to be the happiest. “Renset” consist of characters in deep love ready to resist any obstacle. I think we have a tendency to emphasise short lived pleasure over happiness and real love – are we not all small children that really just wants to be loved by someone? 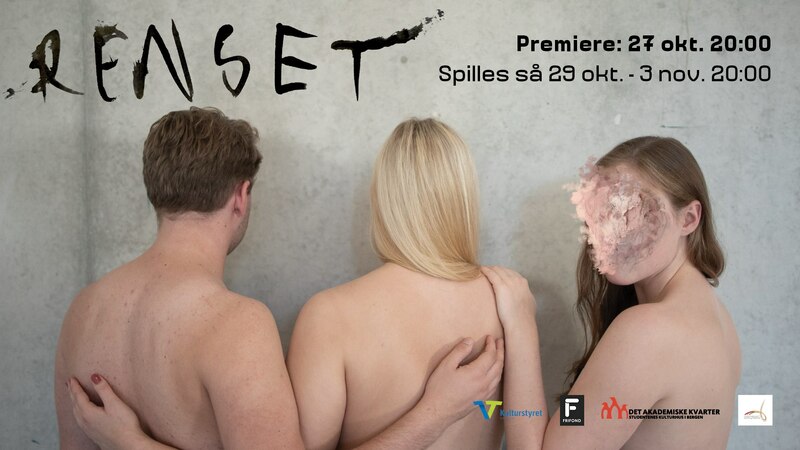 Theater is not synonymous with drama and this production of “Renset” will not let the written word lead the way. The theatre situation, where the plays gets unique in their meeting with the audience, will be the starting point for “Renset”. This scenographic landscape will not just stay within the theatre room, how can the real world be a part of “Renset”? I do not want an audience that is afraid to not understand when there is nothing to understand, only experience. Is not the goal with theatre to let the audience learn something about themselves? On particular Saturdays Det Akademiske Kvarter the entire house will be filled with a theme, where there will be fun events on every floor. This can be concerts, workshops, dancing floors, quiz, show, games – do not let this examples stop the creativity, everything is possible! Immaturus will arrange Helhus 20th of October and will fill Det Akademiske Kvarter with exiting and entertaining content from start to finish. Which theme and which activities are not yet decided, but Kunstnerisk Råd (The art council) is looking forward to arranging an amazing Helhus. We will see you 20th of October for a party you will never forget at Det Akademiske Kvarter! We wish for help from creative souls that can help us with everything from coming up with an idea to decorating, here there is something for everyone. Does this sound fun? Then the Helhus committee can be something for you. Please contact the head of Helhus at kr@immaturus.no for more information. Poetry night is an evening where it is easy to get restful. It is arranged by Immaturus` own writinggroup and consist of both invited guests and Immaturus` own Immaturus poets. The night rounds off with open mike, where the audience can read whatever they want to. At Poetry Night everyone is welcome to perform. It is the perfect opportunity to finally let an audience hear the words you might only have written for yourself. Poetry Night is arranged three times this semester and Immaturus wishes all poetry enthusiasts welcome. Open Stage // Open Room is arranged three times per semester and is the perfect event for you who want to perform something, either it is dance, a monologue, illustrations or maybe an art installation? The oppurtunities are endless. The stage is open for you who want to do something performative, maybe a poem, stand-up or a song? If the stage is not enough, the room is open for you who want to use a little more space, maybe because you want to exhibit your art? Or maybe you want to do performance theatre among the audience? Everything is possible. If you need technical equipment for your performance, please send us a mail in advance at kr@immaturus.no. If you are more of the spontaneous type, you can sign up during the event. If you want to sign up for Open Stage // Open Room send a mail to kr@immaturus.no.